Looking for another way to listen to your favorite news program or gabfest on the go? 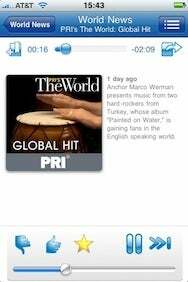 Stitcher, an iPhone app that offers radio programs on demand, has upped the audio ante and introduced live streaming. The new Stitcher 3.0 allows you to choose between both on-demand content and live programs. The app uses the iPhone’s location services to identify nearby live stations, but also lets you pick from a growing list of talk radio stations across the country. The on demand feature remains the app’s hallmark, as it allows wide customization. You can choose programs from a large menu of options: news, sports, political commentary, technology, comedy (The Onion, anyone?). Your selections are saved in your list of favorites, and “stitched” together as a custom station. Like the popular music radio app, Pandora, you don’t need to sync to a desktop; content is streamed via the cellular network or WiFi. Programs in your Favorites list are updated when new episodes become available. Stitcher calls itself “Smart Radio” and has a recommendation algorithm that analyzes the programs you like in order to suggest new ones. Stitcher isn't the only talk radio app out there, of course. It is unique in its breadth of programming, but you won’t find everything, hence the limit to customization. For example, if you’re a dedicated NPR listener, you’ll probably locate most of your favorite shows, but you’ll find a deeper set of programs using NPR’s own iPhone app. Stitcher 3.0 for the iPhone is available now for free at the App Store.